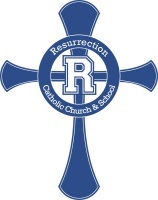 Resurrection Catholic Church & School offers many ministries to help you grow in your faith and serve our community. Dedicated staff members and volunteers lovingly lead our parishioners in activities ranging from prayer ministries to music to youth activities and so much more. Our personal need to serve is not solely dependent on the needs of our parish, but rather on our own need to give and to joyfully recognize that everything we have comes from the Lord! For more information, click on one of the ministries below. Join us!